I remember back in my grad school days reading a study about student pre-conceptions (don’t you dare call them misconceptions now!) about what’s alive and not alive: I believe it was a study by Inagaki and Hatano (2002) reviewing different studies of conceptual change in children to learn how they think about living things. Good reading, even if it’s not required for a response paper! Not surprisingly, animals (the cat) is the most obvious to Kg students of all the items, but I was impressed that plants followed so closely behind. Our Pre-K students do have a general plants and animals unit however, so perhaps that has some influence on this. 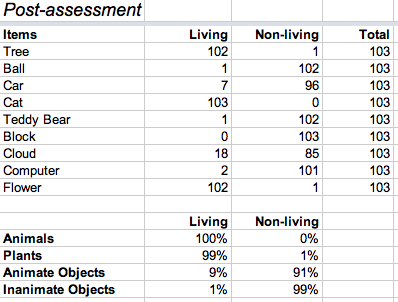 What’s most interesting to me is to notice which nonliving objects are misidentified the most: car, computer, cloud, and teddy bear are all misidentified by about 1/3 of the students! It’s pretty easy to understand why- 3 of them move and change, and 1 resembles a living thing. Not too shabby. Granted this is not a very deep assessment (we have others for investigating students’ understanding in a more meaningful way), but for a quick check of factual knowledge this is good to see. It’s also useful to see what wasn’t learned as well, clouds appear to be especially confusing for some Kindergartners. Thinking about it, they do fit our characteristic of living things by growing and changing, and it’s difficult for students to investigate what clouds need or don’t need. So I’ll have to think more about this one- maybe the right approach would be a research investigation, posing the question Are clouds a living thing? and having students consult various resources (library books, websites, parent interviews) to collect “data” and then reach a conclusion as a class. Something for next year! And that’s the wonderful thing about doing pre/post assessments (besides being a great example of learning for student portfolios)- it’s almost impossible to collect data like this and NOT have it influence and improve your teaching. So give it a try- I dare ya’! 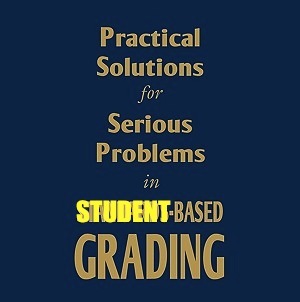 Something’s been gnawing at me for awhile about standards-based grading (SBG). Sure, it’s far and above ye ‘ole traditional ABC grading which conflates effort and learning and spits out a mathematically precise but meaningless grade on a ridiculously large 100-point scale. But moving from ABC grading to standards-based grading isn’t easy- it demands change on all levels of education (teaching, assessing, and reporting) and change from all parties involved (students, teachers, and parents). Changing grading is a colossal cultural paradigm shift. It’s the beginning of the trimester, and we’ve got our standards clearly defined for our unit. We have our assessments planned too, each carefully crafted to hit multiple standards in a meaningful way. And we’re off- teaching, learning, humming merrily along. The first assessment comes along and suddenly there’s a little confusion. What exactly do we mean by “meeting the standard”? “Exceeding the standard”? “Approaching the standard”? Never fear- we collected student exemplars last year, which we can show teachers and students so everyone knows what’s expected. But wait- the students are all trying to replicate the “Exceeding the standard” work, going for that 4, even though most of them need to show proficiency in the standard first before trying to reach above it. Then grades go home and parents are concerned when their students are “only” meeting the standard- that’s like a B right?? So we try to throw in some parent education at that point, to break their bad habit of translating 1s, 2s, 3s, and 4s into letter grades. Finally it’s report card time, and in practice our new standards-based report card turns out to be a lot more complicated than it seemed on paper. What if a student exceeded on this assessment but approached on this one? How detailed should we report out on? Why do these parents keep getting upset with 3s- didn’t we tell them it’s not the same thing as a B?? You get the idea. Like it or not, reporting will always make or break the system, especially in the hyper-competitive, accountability-crazed world we live in. Despite the merits of SBG, the challenges of reporting out standards-based grades (as I discussed here) is unescapable. Even my grading rebel hero who did away with points all together in favor of pure feedback is returning to a hybrid points/feedback system for the sake of efficiency. That’s the reality for both teachers and parents, in addition to the wonderful details, we also crave a simple way of conveying of how a student’s doing (I mean learning!). So here’s the deal: because we can’t escape our need for a simple grade (letter, number, or otherwise), SBG in its present form falls short of the cultural paradigm shift it demands. Parents keep translating numbers into letters, students keep trying to exceed the standard to get the top grade, and teachers drive themselves crazy trying to agree on the meaning of it all. At the core of these tensions is a simple truth: everyone wants to be successful, but everyone is different, so success should not have the same definition for all. SBG is a huge step forward, but because it’s one-size-fits all it just doesn’t feel right, and our efforts continue to unravel. Differentiated: We go on and on in education about differentiation, but so far I think implementation of this has been only partial. For true differentiation it needs to take place at all educational levels (teaching, assessing, reporting)- and it’s last two where it usually falls short. If all students are going to be assessed and reported on the same standard, then by definition we aren’t differentiating. Student-based grading frees us to adapt to student’s individual learning needs, and reflects that differentiation all aspects of education. Learning-focused: In their essence, report cards should communicate what students are learning (or not learning). With one-size-fits all standards, this may not be the case. If a student is way below or way above the standard, the report card isn’t going to be very informative at all. OK, they’re below the standard- but has the student made good learning gains this semester? Yay- they’re above the standard- but is the student continuing to learn or are they twiddling their thumbs? Student-based grading focuses assessment and reporting on the learning that’s actually taking place, whether it’s above, below, or at the standard. Goodbye norm-referencing: Even though standards-based grading claims to be criterion-referenced, if you use points it’s really not. Students (and parents) will always pay more attention to the letter or number at the top than the standards or feedback below. Even if you get rid of these on assessments, for efficiency’s sake you’re going to use points of some sort on a report card- and then the norm comparison begins (Johnny got more 4s than Billy!). Student-based grading means the report cards are different for each student. Students are being graded on the standards and benchmarks that are appropriate learning goals for them. With individualized report cards like this comparing Johnny and Billy isn’t easy- but that’s the point- we shouldn’t be comparing them in the first place. Keep it simple: After thinking a lot about grading and points, I keep gravitating back to the simplest solution: the binary method (pass/fail, meets/does not meet). It’s easy to understand and does not fall prey to our instinct to translate numbers into letters. The problem with using binary grading with standards-based grading is obvious: many students will be somewhere above or below the standard, so the grades are oversimplified and less informative. Student-based grading tailors the learning goal to fit the student, so a binary grade works much better- a more specific learning goal allows for a less specific grading system, and with less confusion. Success for all: Parents can’t help but want to see As (or whatever your top grade is) on the report card. So if your grading system doesn’t make the top grade a realistic goal for students, you’re going to run into problems. Student-based grading adjusts the learning goals for students based on pre-assessment to give them realistic challenges. So students going for the top grade or parents expecting the top grade is no longer problematic, it’s exactly what they should be doing. All set to sign up for the student-based grading movement? There’s only one problem… this is just an idea. Sure it sounds great on paper, but I’ve yet to put it into practice (so if anyone out there is doing something similar- I’d love to hear from you!) Moving from ABC norm-referenced grading to student-based grading would be a step further than standards-based grading, because in addition to all that SBG brings to the table, the reporting benchmarks and standards themselves would need to be differentiated. In order for appropriate learning goals to be selected for students, pre-assessment would need to be very well designed. And to top it all off, the report card system would need to be flexible enough to handle individualized report cards. All these challenges however, if met successfully, would do what standards-based grading seems to be currently failing to do: to once and for all shift our grading paradigm from a culture of competitive point gaming to a culture that values individual learning. You know how you always think teaching is somehow going to get easier each year? I fell for that folly of an idea all over again this summer, thinking that because it’s my fourth year as science coordinator it would somehow be less work because I have it all planned out already. HA! Obviously I was forgetting that deep inside my soul resides a gnawing and persistant little bugger: Mr. Isn’t-there-a-better-way. And just when I thought I was getting set to cruise through the year, he had rear his ugly but inspirational head and get me off my metaphorical couch. So here it is December and I find myself embroiled in several wonderful but seriously extracurricular projects that I’d love to blog about if I can add a 25th hour to the day. Well, here’s on such project: The AERO Science Collaborative Workshop! Ok, I know it doesn’t roll off the tongue very well, so if anyone can come up with some sort of nifty acronym involving those words or similar, I’d be much obliged. A little background: Project AERO is an educational arm of the U.S. State Department created to assist American schools abroad in implementing standards-based curricula. My school, along with most in the NESA region have adopted the AERO standards, in particular the K-8 science standards which were released two years ago. However, as international schools are by their nature isolated, we have very little opportunity to work together with each other and share what’s working with this standards-based shift. Yes, there are conferences set up by NESA and AERO which allow for some collaboration- but as with most conferences the focus is mostly on professional developments (aka listen to the expert at the front of the room). So basically we’ve got several schools toiling with their heads down in the sand (quite literally in the Middle East), trying to complete this science curriculum overhaul with occasional support from consultants here and there, but mostly going it alone. Which of course means a lot of work for everyone and not a lot of feedback or second-opinions on the best way to go about it. 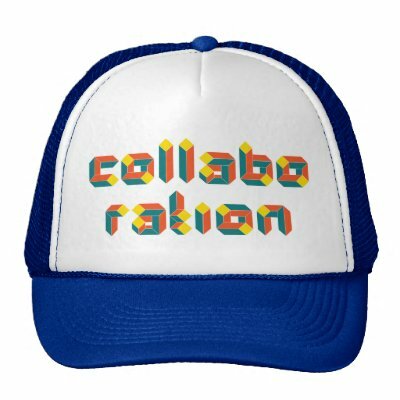 Why not get together and get our collaboration on? This April we are attempting to do just that. With the help of my ASD colleagues and NESA science ed guru Erma Anderson, I’ve drafted a proposal to bring together K-8 science educators from five school (ASDubai, ACS Beirut, TASIM Oman, and ACS Amman) for three days of peace, love, and music…. whoops– wrong workshop– I mean three days of intense science curriculum collaboration. We’re hoping for around 20 teachers, with representation from lower elementary, upper elementary, and middle school. So far the response has been very favorable, and it seems I’m not the only one out there who sees the benefit in teachers teaching teachers for a change. What’s the best way to kick-start collaboration with a group of unfamiliar people? What organisation or set-up helped (or hindered) collaboration? What tools or technology did you use to facilitate collaborative work? What follow-up helped the collaboration continue after the workshop and build lasting collaborative relationships? I’m thinking of starting with something called “Share Your Strengths” where each school briefly presents some of the curriculum work they’ve done that they think is good stuff. This will not only get our best ideas out there quickly, it should also give us a chance to build a little rapport and trust so we respect each other’s opinion when we dive into collaborative work. In my experience small group work (about 3 people) seems to be the most productive. You get a variety of opinions but don’t get weighed down by too many. So depending on numbers I’m thinking of breaking us up into teams of similar grade-level and possibly subject interest (so for example, a team of MS teachers working on a physical science unit). I don’t want to over-structure the workshop since I want it to be tailored to school’s needs, so the goal for each team’s work may even be left up to them. I know how it is after a conference. You have all this stuff you’re excited about, but then you slip back into your daily grind and never get around to all those good ideas you had. I know 3 days isn’t much time to build “lasting collaborative relationships”, but I’d like to try to nurture the collaboration to the point where it’s self-sustaining. I’ve been blown away by the high level of collaboration going on in the blogosphere, so maybe I’ll even try to turn teachers on to that. The secret ingredient seems to be that blend of the personal and the professional- both intellectually and relationally stimulating.